First of all, I'm sorry for any sadness that may have seeped out yesterday. Monday is always a hard day, after coming back from the weekend. We also just had a weekend of beautiful weather, and are now looking at a cold week of rain. 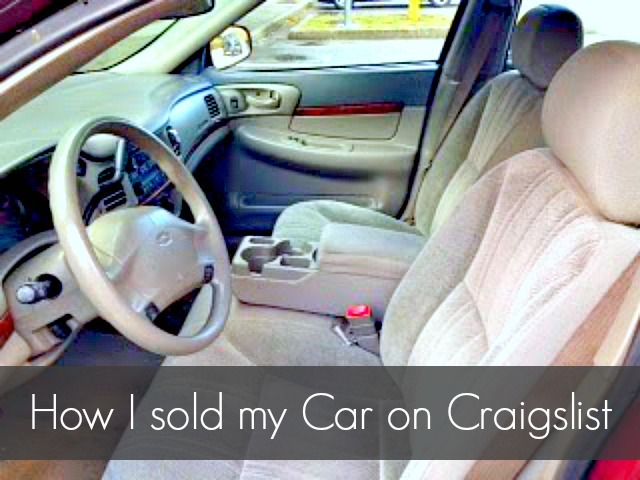 But moving on, before we get started there are a few things that you must have before you can sell your car on Craigslist. 1. You must hold the title to the car. Otherwise you cannot transfer the title to someone else. So that's pretty obvious. 2. The car must be in your possession. This really isn't mandatory, but nobody is going to buy it if they can't see it. 3. You must know an accurate value of the vehicle. This includes an estimate of any repairs. Look on Kelly Blue Book to find this information. 4. You should also have the VIN number, so that people can do a CarFax report if they'd like. In January my car had been paid off for a number of years. I owned a 2003 Chevrolet Impala, but it was starting to have more and more issues that were costing me a lot of money to repair. I do a fair amount of driving for work, and I knew that I couldn't rely on this car anymore. 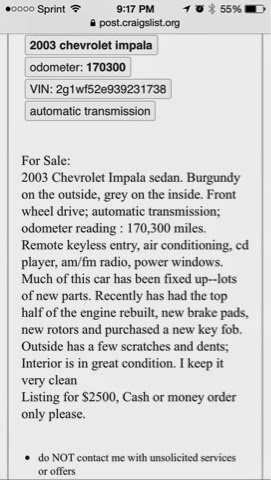 I decided to post it on Craigslist to see if anyone was interested in purchasing it. It was in pretty good shape, so I knew that I had a good chance of getting the price I wanted. Around the same time I listed it online, I took it to my local mechanic and got an estimate for some of the work that was deemed "essential" for the near future. I didn't include that in my post, but kept it handy for people who wanted to see the car. I originally listed my vehicle for $500 over what it was worth. This is so that I could negotiate with buyers on price, and still get the price that I was looking for. I highly recommend that you price your item higher to allow for negotiation. I received SO MANY emails about this car, but you could tell that many of them weren't serious. I only wanted to meet people if they were serious about purchasing (especially since this was for a large sum of money), so I had to be very careful when contacting and meeting people. Eventually a couple came to see and test drive the car, and we agreed on a price. They picked it up the next weekend and we went to the DMV to turn in plates and for me to turn the title over to the new owner. I called my insurance company as soon as I left the DMV to cancel my insurance on that vehicle. I also included a bill of sale. This was written by me, and was signed by me and the buyer. It stated that they agreed to buy the car as is for the agreed price. I feel that this just gives me a little more protection in writing were anything to happen. Once I sold my car, I quickly purchased a new one! But more on that later. 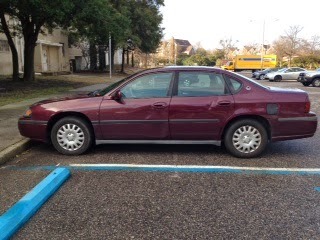 I would love to know if anyone else has had luck selling (or buying) a vehicle on Craigslist. It is such a great resource! Sidenote: Today I am linking my PB&J Overnight Oats up to Lil' Mrs. Tori, Nap-time Creations, The Winthrop Chronicles, The Recipe Critic and Tiny Sidekick. Go check out the amazing things everyone has created there!